James is set to return to North America for a West Coast run of dates around their performances at the Coachella Valley Music and Arts Festival, before heading off to Mexico and South America. Returning again with their original line-up, the UK band recently toured the UK’s most beautiful and premier classical venues playing songs from their vast catalogue with a new spin--performing with a full orchestra and choir in tow. James received critical praise for their 2010 US tour and two-disc CD ‘The Morning After The Night Before’ and are writing music for their follow-up album. 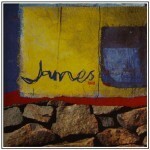 James is also set to release ‘The Gathering Sound’, a limited edition deluxe box set, this spring. The set includes three CDs, a DVD, a 12” vinyl record and a unique j-shaped USB stick. The USB stick includes James’ 11 studio albums and non-album “best of” tracks in 16 bit FLAC and 320 kbps MP3 formats plus the videos for the singles. The videos will be in a format that will allow you to load them onto your mobile device (smart phones, iPod touches, etc). The three CDs feature an album of live rarities, one-off studio rarities and one with The Morning After The Night Before. The DVD features Come Home Live, their legendary homecoming show at Manchester’s Gmex, available on DVD for the very first time. 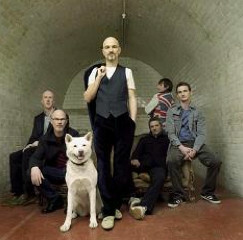 James is: Tim Booth (singer), Jim Glennie (bass), Larry Gott (guitars), Saul Davies (guitar, violin), Mark Hunter (keyboards), David Baynton-Power (drums) and Andy Diagram (trumpet). Gott and Jim Glennie (whom the band is named after) were founding members of the band and together with Booth formed its nucleus. In 2006, Gott and Glennie contacted Booth again and asked if he was interested in a reunion. The result was the 2008 release of ‘Hey Ma’, the band’s first album in seven years. Two years later, James returned with two-CD set ‘The Morning After The Night Before’ and a long awaited and critically-praised U.S. tour. 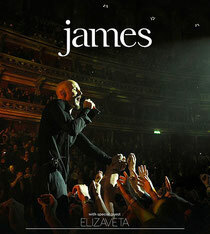 James has released 11 studio albums, sold more than 12 million albums worldwide, and has had almost 20 U.K. Top 40 singles. Their 1993 Brian Eno-produced album ‘Laid’ resulted in the huge modern rock hit singles ‘Laid’ and ‘Say Something’, resulting in a top spot on the Billboard 100 Chart and a gold album. The New York City-born, Russian-raised musical alchemist Elizaveta will be the special guest on the North American shows. With the ability to seamlessly fuse opera, electronic music, pop and indie into an intoxicating and infectious hybrid, Elizaveta has tastemakers buzzing. Her debut EP ‘Beatrix Runs’, out now, is a prelude to her Greg Wells-produced debut album due in the coming months on Universal Republic. For the latest James updates, tour news and information on VIP packages including access to the band's soundchecks, visit www.wearejames.com.